🇫🇷 It's Tuesday morning, and a dark day in the City of Lights. 🏈 Situational awareness: Seattle Seahawks quarterback Russell Wilson is the highest paid NFL player in history — with a four-year, $140 million extension that includes a $65 million signing bonus, ESPN's Adam Schefter reported after midnight. Be smart: President Trump probably could have won in 2016 with no money. Rich Lowry column in N.Y. Post: "It survived the rampages of iconoclastic Huguenots in the 16th century, the depredations of radicals during the French Revolution in the 18th century (they transformed it into a shrine to the Cult of Reason, used it as a warehouse and wanted to melt down the bells) and incidental damage during two world wars in the 20th century." 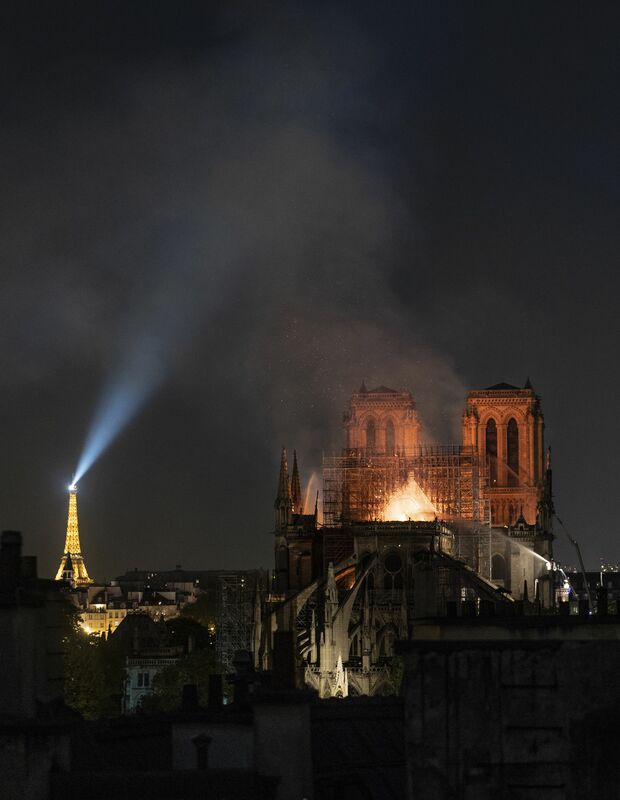 "[I]t’s difficult not to discern a distressing message in the wanton destruction that ravaged the iconic cathedral — what prior generations so carefully and faithfully built, we are losing." 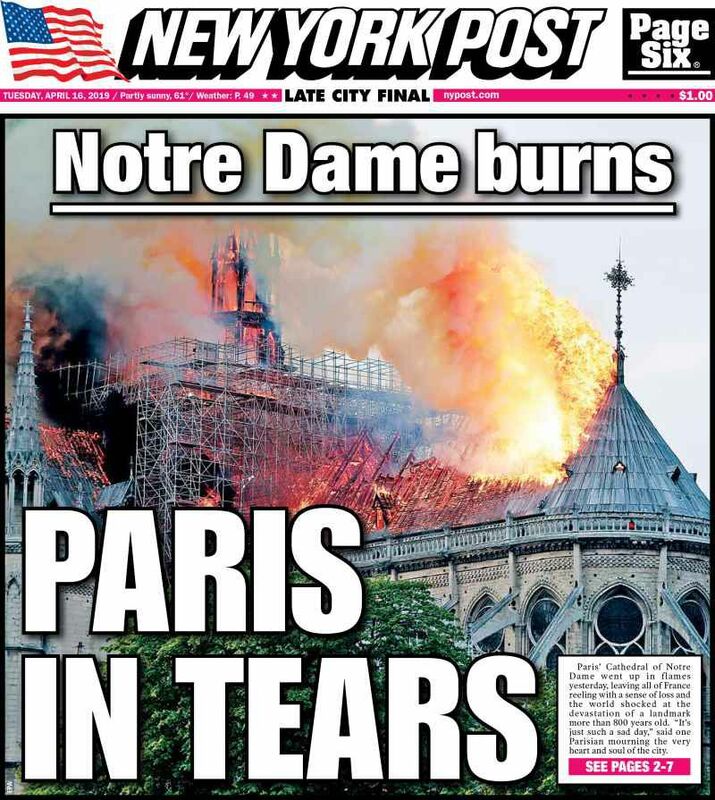 WashPost's James McAuley: "To have lived in Paris in recent years is to be well acquainted with loss and even unspeakable tragedy." 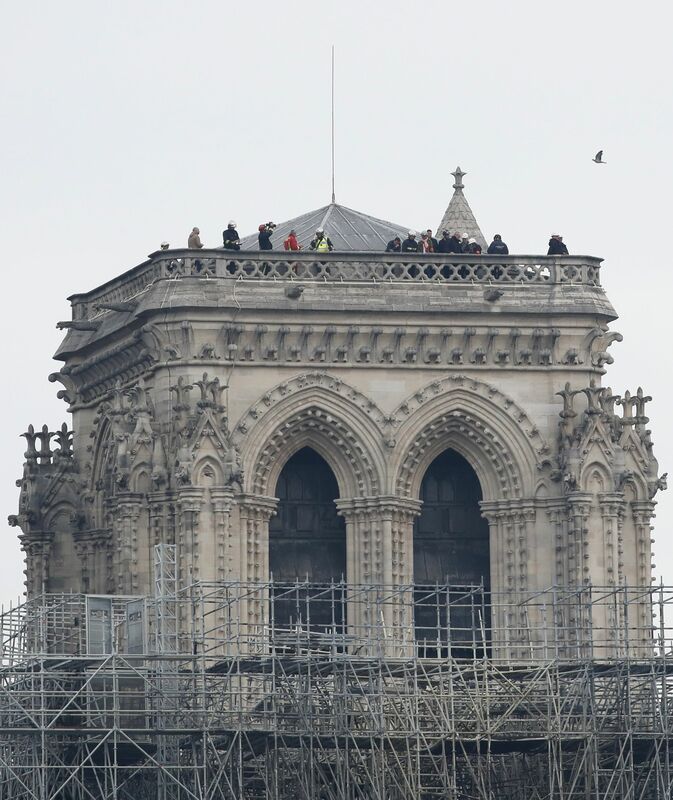 N.Y. Times architecture critic Michael Kimmelman: "Visited by some 13 million people a year, the cathedral, established during the 12th century, is the biggest architectural attraction in Paris." "It is an emblem of the old city — the embodiment of the Paris of stone and faith — just as the Eiffel Tower exemplifies the Paris of modernity, joie de vivre and change." The Trump campaign is spending nearly half (44%) of its Facebook ad budget to target users who are over 65. Democratic candidates are only spending 27% of their budgets on that demographic, according to data given exclusively to Axios' Sara Fischer by Bully Pulpit Interactive. Why it matters: In the wake of huge 2018 Democratic gains among young voters, older voters will be even more critical to Trump's strategy in 2020. Trump is using nativist language around immigrants in 54% of his ads, according to Bully Pulpit. So far, Democrats have not responded in kind on the topic of immigration and are focused on fundraising and other policy issues. "The one thing the Trump campaign has proven time and again is that they follow the results and optimize for outcomes and not the general consensus," says Zac Moffatt, CEO and founder of the Republican firm Targeted Victory. How it works: In March, Facebook opened up its ad archive for the first time in a way that makes it possible to glean insights about a campaign's targeting and messaging strategy. Previously, only spending data was available. 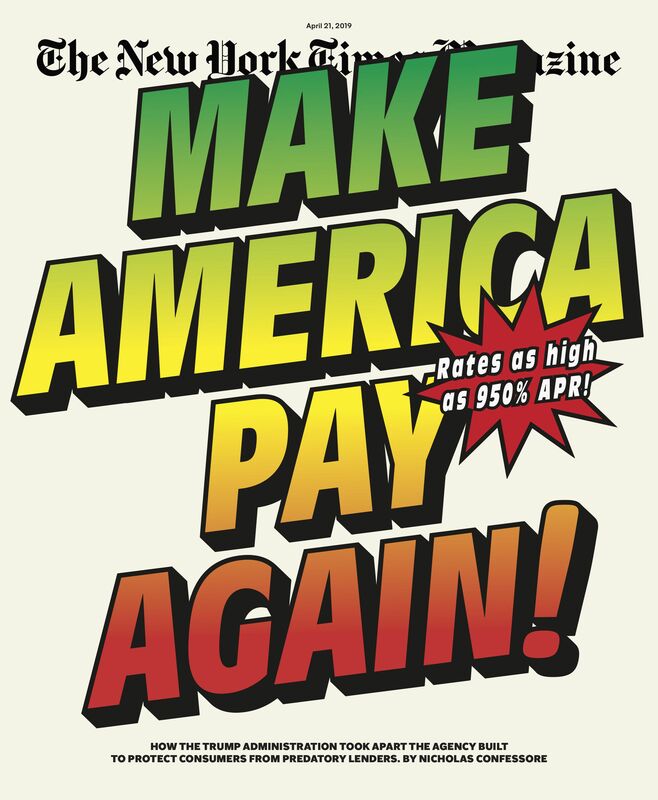 The Trump campaign is only targeting voters 18-35 with 4.3% of its total ad budget. Democrats Bernie Sanders and Beto O'Rourke are doubling down on young people, spending almost four times as much as Trump to reach those voters. Both Democrats and Trump are targeting middle-aged people, ages 34-65 roughly, at the same percentage of total spend. Be smart: Traditionally, campaigns targeted older viewers mostly via national TV buys or direct mailings. This data shows that the Trump campaign sees an opportunity to target them digitally, too. 5. Are you quoted in the Mueller report? Some of the more than a dozen current and former White House officials who cooperated with Robert Mueller are worried that his report — now expected Thursday — will expose them as the source of damaging information about President Trump, NBC's Carol E. Lee, Hallie Jackson and Kristen Welker report. "They got asked questions and told the truth and now they’re worried the wrath will follow," one former White House official said. Some of the officials and their lawyers have tried to find out if witnesses are named (or obvious), but "the Justice Department has refused to elaborate." "What he left behind is an agency whose very mission is now a matter of bitter dispute." Why it matters: "Mulvaney’s careful campaign of deconstruction offers a case study in the Trump administration’s approach to transforming Washington, one in which strategic neglect and bureaucratic self-sabotage create versions of agencies that seem to run contrary to their basic premises." The South Florida Sun Sentinel and Pittsburgh Post-Gazette won Pulitzer Prizes, recognized with the Capital Gazette of Maryland, for covering horrifying mass shootings at a high school, a synagogue and a newsroom, AP reports. AP won "in the international reporting category for documenting the humanitarian horrors of Yemen's civil war, while The New York Times and The Wall Street Journal were honored for delving into President Trump's finances and breaking open the hush-money scandals." 8. 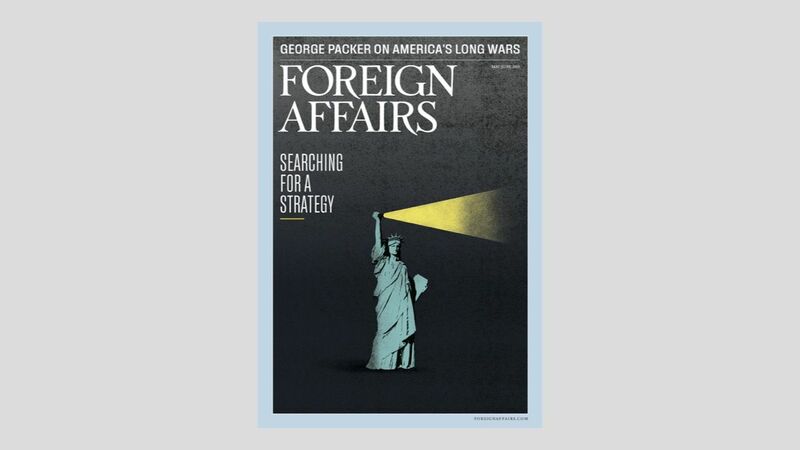 First look: "This Time Is Different"
"Why U.S. Foreign Policy Will Never Recover" ... Daniel Drezner, Fletcher School professor of international politics, argues in the forthcoming issue of Foreign Affairs that American hegemony is not coming back. "For decades, the sky has refused to fall. But this time really is different. Just when many of the sources of American power are ebbing, many of the guardrails that have kept U.S. foreign policy on track have been worn down." "[T]he erosion predated [Trump] by a good long while. Shifts in the way Americans debate and conduct foreign policy will make it much more difficult to right the ship in the near future." Shares rose for Nike, the sponsor that stood by Woods after his 2009 car crash and reports of extramarital affairs. TV ratings of golf tournaments and sales of golf equipment are likely to rise, at least in the short run. Nike stopped selling golf equipment in 2016 to focus on apparel. About a year later, rival Adidas sold off its golf business. 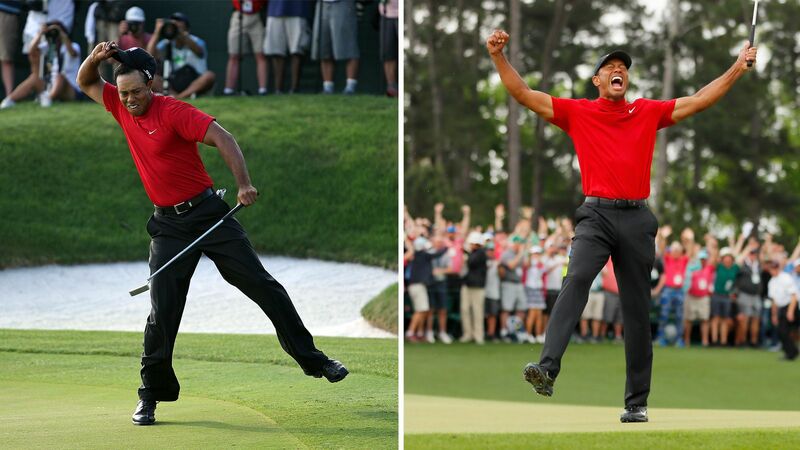 During the tournament, Woods wore head-to-toe Nike, with the swoosh on his hat, shirt, pants and shoes. That beats the previous record by 500,000 — the 2017 finale of Season 7, when the show averaged "an astonishing 31 million viewers per episode once live, time-shifted, on-demand and streaming plays are tallied." Sunday's tally "includes 11.8 million viewers watching the first-run telecast, and a 50% jump in viewers for the growing streaming platform of HBO Now." 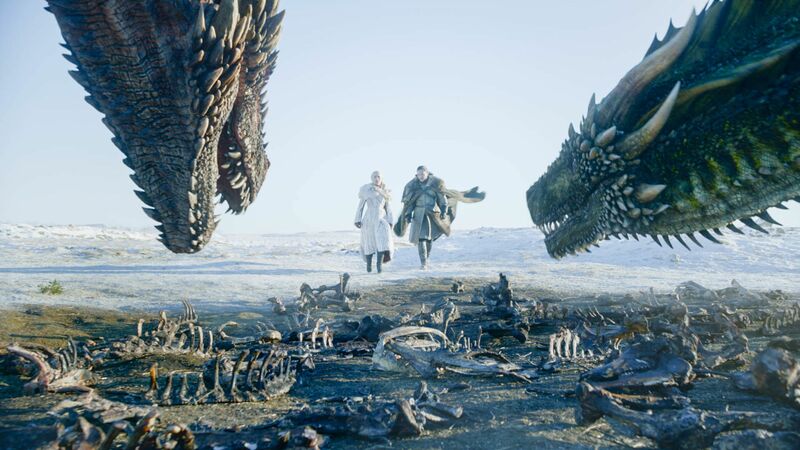 Be smart ... Axios' Sara Fischer, in today's Media Trends newsletter, warns of "the end of appointment TV" since "Thrones," one of the last remaining shows that kept an appointment-viewing culture alive, is nearing its end.